Everything is a long standing desktop search program for Microsoft Windows devices that is both powerful and very fast. Our first review of Everything dates back to 2008, and the most recent one took a look at the first beta in 2013 that introduced 64-bit support in Everything. Everything is a search program for Windows that uses fast indexing to display files and folders to the user. The initial indexing is very fast, and should complete in less than a minute if a lot of files are on the system. The author states that indexing of a fresh Windows 10 installation takes about 1 second to complete. The name Everything comes from the program's display of data. Unlike Windows Search, which displays matching files and folders based on a user's input, Everything displays all files and folders initially, and filters them based on the user's input. Everything 1.4 is the most recent version of the search program. It was released back in November 2015, and introduced several new features to the application (and was updated several times subsequently). The latest version of Everything is offered as a 32-bit and 64-bit portable version, and as a setup version. The program is compatible with all versions of Windows starting with Windows XP, and can run under user or administrative accounts. If run under a user account, Everything either needs to be run as administrator or as a service for NTFS indexing to work. The software creates indexes of all fixed volumes automatically. 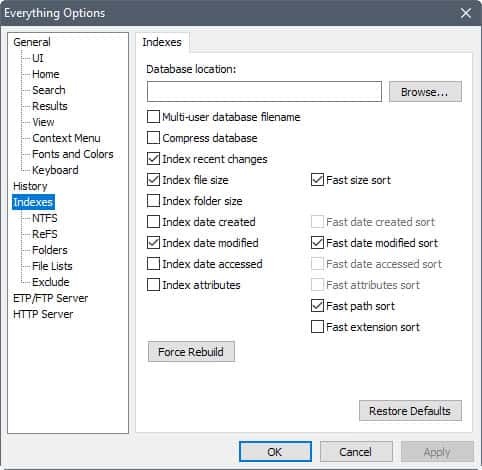 You can add removable volumes to the indexing process under Options > Indexes > NTFS (or ReFS if that file system is used). The core functionality of the search program has not changed. The start of Everything is very fast, and a list of all folders and files is displayed on start. The table lists file and folder names, full path information, the last modification date, and for files the file size. Filters are applied as soon as you start typing. This process is instant, and there is no lag on your system as Everything filters files and folders based on your input. One of the greatest strengths of Everything, besides that it is blazing fast, is that it offers an impressive set of features and customization options. You can use content filters for instance, run pretty much any command or feature using the keyboard, and even run the program from the command line. Advanced Search allows you to build complex search queries. You may use it to find files using parameters such as file names, words or phrases in files, location, modification date or period, and size. (Search > Advanced Search). Multi-File Renaming. You can rename multiple files at once in Everything 1.4. Supports changing text in all filenames, changing extensions, finding and replacing text, or editing all filenames in one edit box. (to use, select multiple files and hit F2). Content Searching. You can use Everything to search in files. Please note that content is not indexed, and is very slow as a consequence. (use content:text, or ansicontent:text, utf8content:text, utf16content:text, or utf16becontent:text for content searches). Fast reindexing. Everything runs a reindex operation whenever a new volume is added or an existing one removed. Everything 1.3 ran the operation on all drives, even on drives that did not change at all. Everything 1.4 uses existing up to date indexes and skips drives that have not changed. Thumbnails support. Images may be displayed as thumbnails in Everything when you enable the option. Useful in combination with the pic: filter. (View > Medium, Large, or Extra Large Thumbnails, or hold down Ctrl-key and use the mouse wheel to change the display type). Everything 1.3 was the last major release prior to the release of Everything 1.4 that introduced important features and improvements to the search program. Everything Service. When installed, Everything may run as a standard user. It allows indexation of NTFS volumes and the monitoring of USN Journals. Only required if run under a standard user account. Recent Changes filters. You can use the rc: command to search for recent changes. Run History. Keeps track of how many times you open files or folders from within Everything. The highest run count file or folder is picked automatically when you hit enter from the search edit. 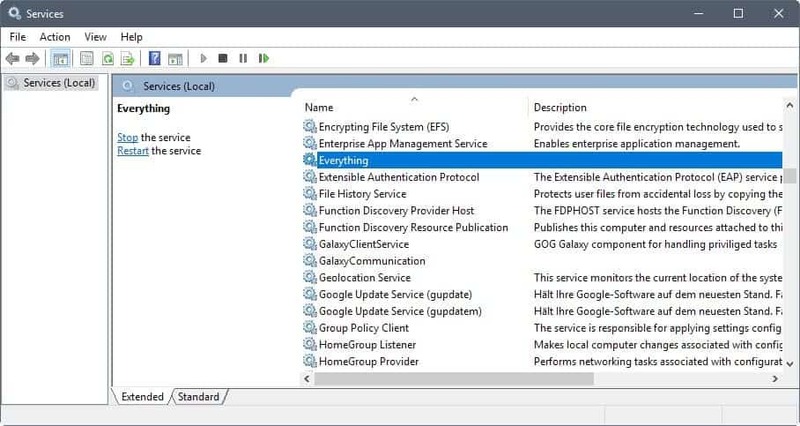 Can be disabled under Tools > Options > History > Enable run history. Search History. Lists all previous searches made in Everything. The feature is disabled by default, and you can enable it under Tools > Options > History > Enable search history. Bookmarks enable you to save searches, filters, sort and index operations. Select Bookmarks > Add to bookmarks to add a new bookmark, and Bookmarks > Organize Bookmarks to manage them. File Lists may be created from within Everything, and loaded into the program at any time. To create a new list, select Tools > File List Editor, and use drag and drop to add files and folders to it. The lists are saved as CSV files, and may be loaded using Tools > Options > File Lists. Useful to keep a record of removable volumes or optical discs among other things. May also be run from the command line using everything.exe -create-filelist <output-filename> <path-to-scan>. Folder indexing. Everything indexes volumes by default only. You can add folders that you want indexed as well. Allows you to index Fat32 and other volumes that Everything does not index directly, network shares, or mapped network drives. You may add folders under Tools > Options > Indexes > Folders. Match diacritics may be used to match or ignore accent marks. Toggle under Search > Match Diacritics, or by using Ctrl-M.
Filters allow you to run custom searches by selecting them. Everything ships with filters for finding specific types of files such as compressed, audio or document files. Use and edit from the Search menu. Windows is home to plenty of search programs. You can check out our guide on the best search programs for a list of them if you are interested. Everything is a great program, and there is little that one can criticize as it is well designed, feature rich, but still puts users in control in regards to its feature set. Everything functions. The listing on the project website lists all functions that you may use when you enter your search terms. Functions like content:text, daterun:, empty:, type:, or height: provide you with options to run more complex searches. You may combine functions, and use constants as well. List of supported keyboard shortcuts. List of command line options. Great software, use it almost daily. 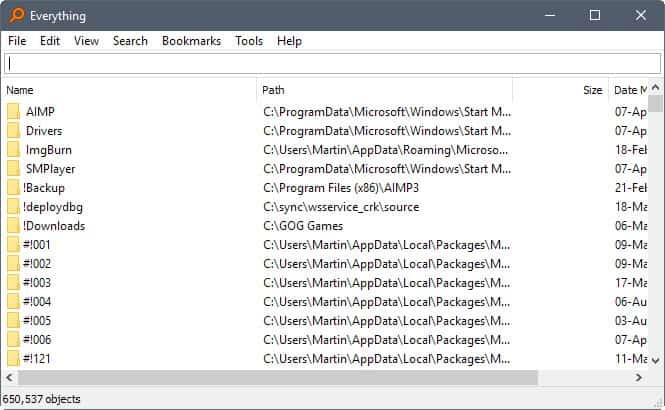 Does this program only search/index your pc or does this extend to networked or mapped drives? May also index network folder or drives. One of the best programs ever & it’s free. The bookmarks feature make it the best ! There are many other variations you can use. I’ve had this installed for a couple of months, it’s defintely very useful. Worth to mention is that Total Commander integrates well with Everything – you can replace its internal file search with a query to Everything – works lightning fast. Chris I have modified the sentence to reflect that. Nearly every day, often many times, I have to locate something. Searching manually or with the builtin search is frustratingly slow. This program should be on every Windows PC. People who don’t have it really don’t know what they are missing. My must have program. I don’t loose minutes waiting for search to finish. This is my go-to search tool on every PC I own.. Very useful! Great program, however it lacks just that bit of extra user interface that would make it conveniently non-geeky for me. It’s such an indispensable add-on to Windows because Windows search is so broken. If I were Microsoft, I would put a few dozen million dollars on the table to buy it off, like it did with Russinovich, and stop the shame. But MS is busy pulling things on the cloud, so why bother ? A small correction: Everything 1.4 was not released in Nov 2015, but just this week (well, 1.4.1.877). It was the BETA of 1.4 which has been out in various non-final versions ever since 2015 (September). A MUST-HAVE software on PC for daily uses. While I do find it indispensable, I’m wondering if there are other desktop search engines that are worth looking at. If you want to search inside files, too, have a look at File Locator (powerful free version, even more powerful and quite expensive pro version), and at File Seek (free or cheap). Few things are truly free, how does “Everything” make money? Is it safe to use this, even on an SSD? On a side note, this program is epic! Can’t believe I’ve been using terrible Windows search all these years. Just hope my SSD doesn’t get too many writes from this.